One Pack performance coating for kitchen and bath. 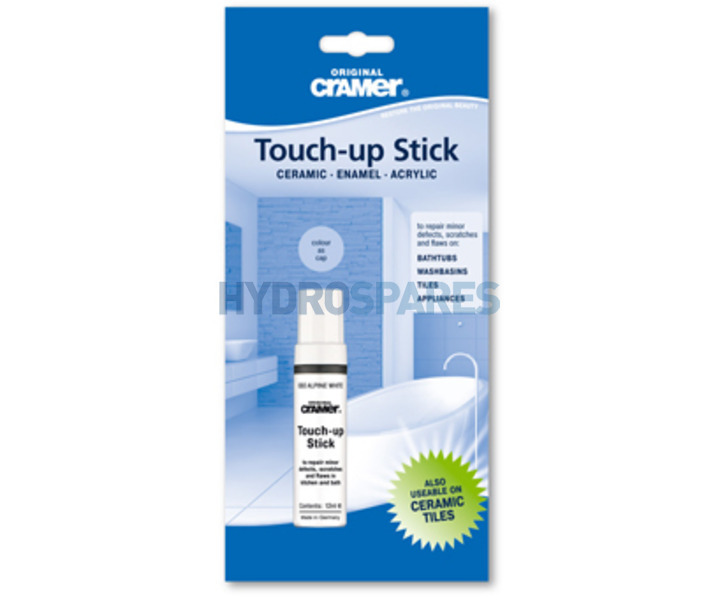 The Cramer Touch-up Stick enables you to correct minor damage, scratches and blemishes quickly and economically. Designed for ceramic, enamel, acrylic, metal, powder-coated and painted surfaces. Also suitable for replacing missing glaze at the edges of tiles. The Cramer Touch-up Stick is a filling compound and final coat all in one making it ideal for repairing impact damages, scratches and lacquer flaws on sanitary fixtures, tiles, fittings, heaters, kitchen sinks, ovens, washing machines, refrigerators and furniture. Perfect to touch-up flaws, scratches, defects and minor damage on kitchen and bathroom fixtures and appliances. The touch-up stick allows an easy, instantaneous and inexpensive repair on enamelled cast iron and steel, ceramic, fibreglass, acrylic and other similar material in the kitchen and bathroom. The stick is ideal for touch-up of minor flaws, scratches and defects on sanitary ware, kitchen sinks, tiles, heating radiators, refrigerators, stoves and kitchen & bathroom appliances. The area must be clean, dry and free from grease and rust. Apply the coating in multiple thin coats, allow the repair to dry for 24 hours. Replace lid and tighten well after use. In order to enable it to achieve 100% hardness do not use water on the repaired surface for a period of 4 days. Do not use either concentrated or abrasive cleaning agents on the damaged area. Do not use any disinfectants or organic solvents. Heat resistant to 60 degrees. Worked very well. Finish whiter than looked. Did the job but expensive. I have heavy square taps (internal fittings) above the bath and one of these came off and fell into the bath, it's got 4 tiny chips in the acrylic bath, does your product repair this type of bath? Thank you. Yes, the touch up stick is a light filler and top coat in one, its suitable for very small chips and scratches. The bath repair kit with filler and top coat separately is best for anything larger.